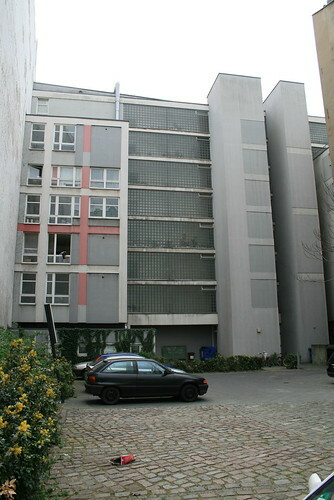 Actually two separate, unrelated buildings, but both done for the Berlin IBA 1987, as part of the Neubau programme. 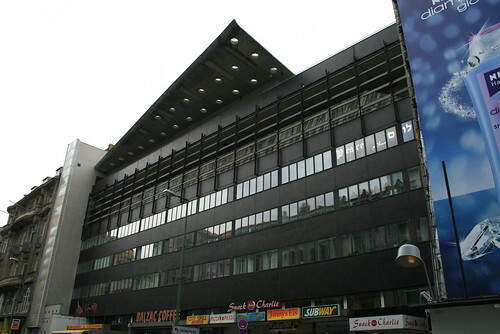 Both are at tourist ground zero in Berlin, and have understandably suffered from the grime and commercial signage of the area, but Eisenmann’s building in particular hasn’t weathered well. Disappointing though are the rear communal spaces. 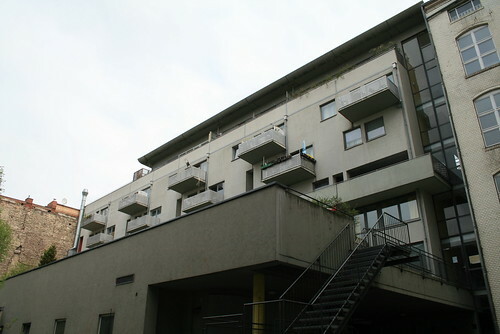 In OMA’s case there was clearly very little room available on the tight site, and the balcony arrangement makes the best of a bad situation. 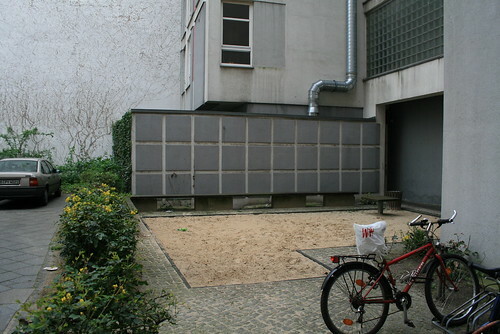 The Eisenmann building does have some space round the back, but seems to have done little with it – compare this with the communal spaces of some of the other IBA buildings and it seems like a lost opportunity. Admittedly it has to suffer the messy rear access areas of shops at ground level, but even so… The design though is more complex than may be apparent to the casual observer – the floor plans are oriented to two different grids: that of Berlin’s 19th century extant street grid (i.e. the existing streets and blocks around it) but also the Mercator grid (i.e. 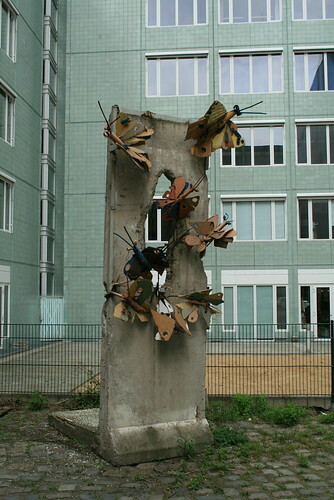 the global orientation of east-west-north-south), apparently referring to the concept that the building existed both in its immediate context, but also tied West Berlin (as it was at the time) to the rest of the world as global location. A nod towards the residents’ facilities (a sandpit, basically) although the grid motif is carried through to small scale. What is really interesting about the Eisenmann block is not (only) what was built, but what wasn’t. The original competition was for the entire block, retaining only a handful of existing buildings. Eisenmann proposed a complex series of off-set grids, forming a public garden, to create “a monumental and symbolic area […]” which would be “…sufficiently profound to excavate all its cultural meanings.” If this sounds a bit pompous, it should be borne in mind that at the time the site stood in the shadow of a still very real Berlin wall. I don’t know whether the fall of the wall killed the scheme, or some other factor. Interesting to compare this with Eisenmann’s now built Holocaust Memorial. Great post, I did not know about the Eisenman building. Never caught my eye, anyway. The OMA one is OK considering it was built 20 years ago. The oma building originally had no shops at ground level.Instead the apartments spanned over a car park space where vehicles could also turn around before the checkpoint which was immediatley ajacent and still operating when the building was completed. The kiosk and look out point that formed part of the car park area where expressed in a ‘check-point’ architectural language making the building more oddly disjunctive, but of its site, than it appears today. Thanks Charles – another useful comment which will send me scurrying back to look at the building anew. I note from more recent reading on the Eisenmann block that there was an ‘intermediate’ version with a smaller grid-based memorial, but including the building now standing. PS tried to look at your blog but just leads to a WordPress ads page. Ha! I think its meant to be blogspot NOT bogspot as I wrote before! How embarrassing. It’s been corrected now. 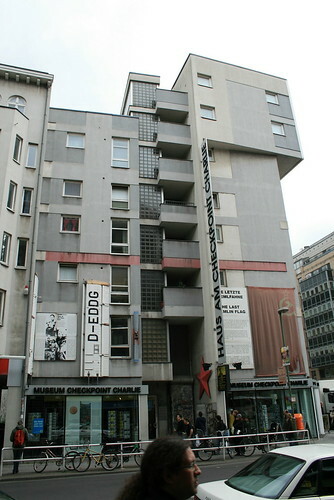 I lived in Berlin in the mid ’90’s and remember all those IBA buildings well, so I’ve really enjoyed reading your blog. Makes me miss it though. Don’t know about the intermediate Eisenman scheme although I recall seeing a drawing of the projected red grid somewhere. Hello, I find verry intresting these comparison, actually I am studing Arquitecture in Mexico and I have a case study on the Eisenman building and I cant find any ralated info fron the iner distrebution, and the design plans, I have checked many books and in his oficial webpage, do you know where can I find them? I am not very keen on the OMA building. It is very alien to its surrounding. True. Although the surroundings are themselves pretty strange – the Eisenmann building opposite, Kleihues’ to the north, and still a partial wasteland from the time of the wall and the war… I have to admit though, it’s not a building that I have strong feelings for. Hi there. I just wanted to thank you for the great work you have done in describing and making pics about Berliner buildings. I know that costs a lot of energies and time. I have done my PhD in Beriln as well with the purpose of exploring the refurbishment of former East Berlin houses in Prenzlauer Berg. Lately I have opened a blog for architects and architecture passionates (https://fetzigoes.wordpress.com/) and I am now doing the Berlin map where I pinned all the interesting spots in Berlin. I was wondering if you don’t mind that I put the link at your pages for those who are looking for more info about this or that building.